Connected Life is a group of people who are passionate about Jesus. We live to impact our families, our neighbourhoods, our communities, our workplaces, our city, our nation, and the nations of the world for Christ. Connected Life is local church in partnership with other churches around the world. Connected Life has a close relationship with a team of church leaders who help establish and build local churches around the world. This team is known as New Covenant Ministries International (NCMI). NCMI is neither a denomination nor an organization. 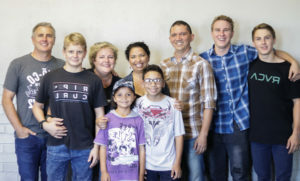 Grant Boreham with his wife Nicolé and boys Daniel, Michael and Andrew, together with Hadrian, Tarin, Connor and Maddison Roberts. A people through whom the love of Christ reaches others. To send out the mature for ministry.